Dr. Eugenio Gallo has been awarded this year’s Charles H. Best Postdoctoral Fellowship, it was announced by Professor Brenda Andrews, the Director of the Donnelly Centre, and by The Charles H. Best Fellowship Committee. Gallo has joined Professor Sachdev Sidhu’s group at the Donnelly Centre, where he uses advanced protein engineering to find new ways to attack cancer. Dr. Eugenio Gallo will develop synthetic antibodies against integrins to study their role in cancer “Eugenio has been a fantastic addition to the group. Aside from his excellence in science, he is one of the most enthusiastic and personable scientists I have had the pleasure to work with,” said Sidhu. Gallo is working on a group of proteins called integrins that regulate how cells communicate with their environment. If this process breaks down, it can lead to cancer. Protruding on both sides of the cell’s outer layer, integrins play two important roles. First, they act as anchors, pinning a cell down in its place, and loosening their grip when a cell needs to move. They also serve as communications channels between the outside world and the cell’s interior, passing on the messages that can switch genes on or off. Should this transmission go off course, it could turn a normal cell into a cancer cell, able to divide uncontrollably and move into other parts of the body. Scientists believe they can stop this from happening by engineering molecules that shut down the haywire integrins. 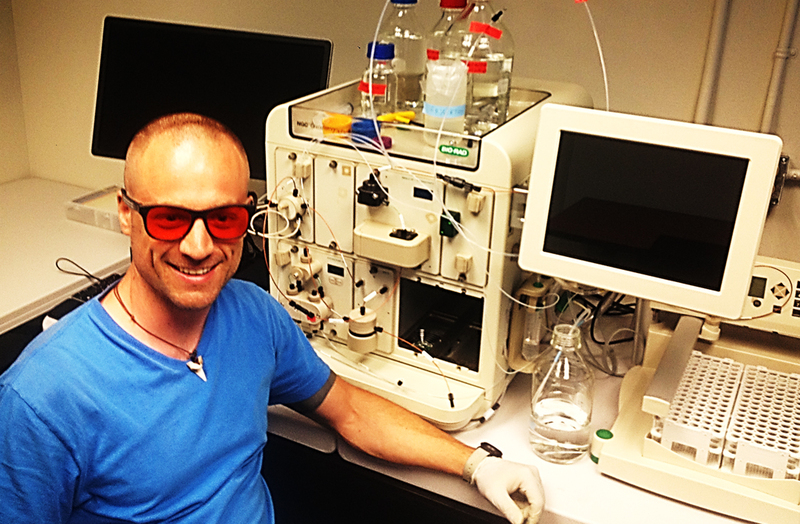 With a strong track record in cancer biology and protein engineering, Gallo is up for the task. During his postdoc, Gallo will first chart out how integrins contribute to cancer in the first place. To do this, he will develop synthetic antibodies, which act as protein neutralizers, against several cancer-associated integrins in human cells. Antibodies are molecules that stick to proteins and can change their functions, typically blocking a part of the protein that, for example, senses a signal from the environment. Usually collected from animals, in a process that can take months, antibodies are precious and hard to get. But with the help of the animal-free, phage-display technology, pioneered in the Sidhu lab for custom antibody design and production, Gallo will be able to quickly compile a toolkit containing hundreds of antibodies to understand how different integrins work in normal and cancer cells. Gallo’s research comes at a time when antibody-based drugs, also called biologics, are gaining popularity as a new generation of cancer treatments. Because antibodies recognize and bind to individual proteins with needle-like precision, antibody-based treatments usually have fewer side effects compared to the blanket approach of chemotherapy. In addition to making a trove of sought-after research reagents, Gallo’s work could also lead to the discovery of new anti-cancer drug candidates. This rare opportunity of applying a cutting-edge antibody engineering technology toward developing new therapeutics, which Sidhu’s team is internationally recognized for, is precisely what attracted Gallo to join the group. “I am immensely grateful for having the opportunity of having joined the group due to its highly collaborative and innovative environment,” said Gallo. Learn more about the 2015 Charles H. Best Fellow Dr. Marjam Barazandeh.